The silk blouse is an extremely versatile piece of clothing in woman’s wardrobe. In today’s post, I want to draw your attention to the best ways how to wear silk blouses. It’s the same as wearing denim jeans, as you can style it with almost everything you want. Thanks to the silky material you can feel dressy. In other words saying, you can achieve the luxurious look without spending too much of your money. The silk blouse is a universal piece that can be teamed with anything and worn anywhere you want. I do love using it with my casual basics and dressy pants at the office. I see lots of gals who sport this chic top with leggings and classy slacks for the office. All in all, there are numerous of ways how to style silk blouse in your everyday life. Anyway, I want to give you some tips and trick on how to make this top look awesome on you. Keep on reading to find out more. You can play safe by wearing a neutral color silk blouse with a printed bottoms. 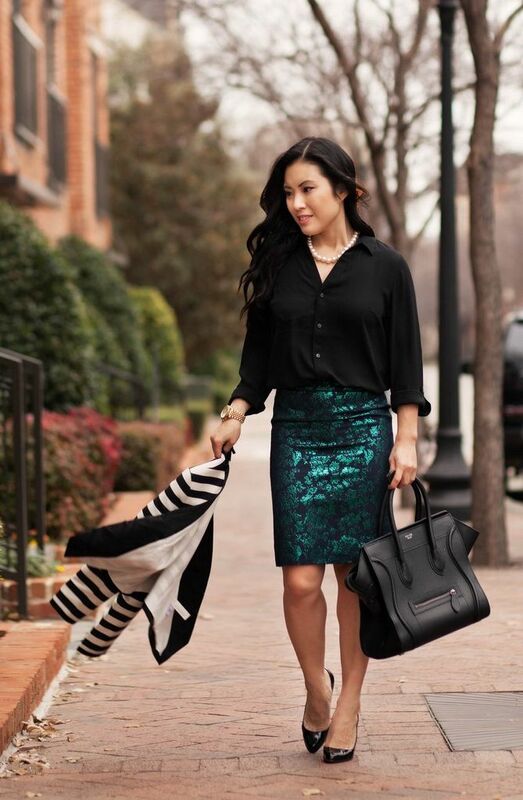 You can try on black silk blouse and tuck it inside metallic green skirt completed with glossy pointed-toe black leather pumps and matte black leather handbag. If you think it’s gonna be cold at the evening, then you can complete your look by adding striped black-and-white blazer. If you do like classy looks, then the best way is to try on floral print lightweight blouse and tuck it inside black skirt. It looks conservative and ladylike. You can complete this outfit by adding golden necklace and cool looking ankle-length black boots. You can keep it hippie inspired by wearing white blouse underneath your favorite wide-legged denim overalls. Complete the look by adding hippie rounded sunglasses and black leather heels. If you want to create a slightly sophisticated and edgy vibe, then the best way is to pair your crispy white blouse with black leather shorts overalls. Believe me, you gonna create a playful and flirty look, all you need is to add ankle-boots. I do love combining mannish garments with feminine basics. For instance, you can try on silken top underneath military jacket. 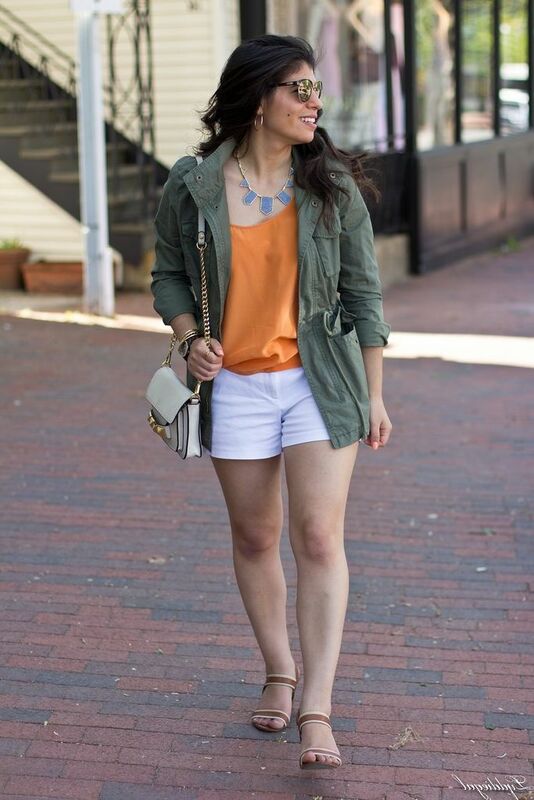 Go for orange silk blouse and style it with khaki green parka. I know gals who keep things elegant and vintage by teaming white blouse with band jacket. This is an ideal way how to give your outfit a boyish update. Speaking of mannish garments, then I recommend to try on men’s suit jacket and wear it atop snakeskin lightweight blouse. This is an ideal way how to create an ultimate androgynous look. Next way can be quite sweet looking. All you need is a pastel color blouse and pleated dark blue mini skirt. Believe me, this outfit is going to be extremely flirty and cute. Are you in search of a mature looking outfit? If so, then I recommend to try on silken V-neck blouse and tuck it inside high-waisted black leather pencil skirt. This is a perfect combo for wearing at the office. All you need is to add a tailored slim-fit blazer on. You can keep things casual by wearing your blouse as a tunic. All you need is to wear your blouse untucked with mini skirt. If you are in search of something classy, then I recommend to try your cream white blouse tucked in midi relaxed-fit skirt and complete the outfit by adding ankle-length beige suede boots. How about achieving safari friendly look? All you need is a relaxed fit white blouse tucked in dark khaki green slouchy sacks. Complete the look by cinching a belt to your waist. If you do not wish to look relaxed, then I advice to try your lightweight silky blouse paired with skinny jeans in khaki green color. Are you in love with preppy and retro looks? If so, then I recommend to try on vintage classy outfit by teaming Peter Pan collar blouse with high-waisted tailored shorts and opaque tights. If you want to keep things office-friendly, then you might like to pair your favorite silk blouse with a tailored, boxy vest and tartan print skirt. I felt in love with this navy band jacket with gold embroidery styled with a white blouse tucked in slim black leather pants completed with black leather criss-cross heeled sandals. The rounded sunglasses with gold mirrored lenses look trendy. By the way, find out more about band jackets for women, as I made a post where I describe all possible outfit ideas you can easily create with this outerwear piece. This office style look that features a tailored black vest worn over pinstripe blouse tucked in tartan print skirt completed with black pumps is a must-try! Speaking of prints, you definitely should read my post about plaid print skirts, you will see simple and easy to copy looks that can make any lady look special. Do You have any thoughts about Silk Blouses For Women? Here are Fashion Tips pictures and trendy women’s outfits which are in style in 2019: Band Jackets, Best Leather Skirts, Best Women's Skinny Jeans, High Waisted Shorts, Metallic Skirts, Midi Skirts, Military Jackets, Mini Skirts, Must Have Fashion Trends For Women, Overalls, Pleated Skirts, Printed Trousers, Shortalls, Silk Blouses, Slouchy Pants, Smart Tailored And Relaxed Blazers, Street Style Women's Fashion And Inspiration, Suit Jackets and tips on how to wear them on the streets.